Is there a minimum order requirement? No, there is no minimum order requirement. What shipping methods do you use? USPS First Class or USPS Priority Mail. For some large orders, shipping may occur via FedEx. Typically items ship 1-2 business days after being placed. Do you ship outside the U.S? Currently we accept online orders from the U.S. & Canada only at this time. What type of payments do you accept? We accept payments via PayPal, as well as Visa, MasterCard and American Express. If you do not have a PayPal account, you will see an option to pay with credit card at the end of the checkout process. Why can't I login? If you are having issues logging in to the site, it might be that cookies are not enabled on your browser. You can either enable cookies or try to login using another browser (i.e. Mozilla, Chrome, Internet Explorer). If you are still experiencing an issue, send us a message and we will look into it to resolve so that you can complete your checkout. What is your return policy? All Sales are final and non returnable. However if any part of your kit is damaged or missing for any reason please just contact us and we will replace it right away. What will I get each month? You will receive supplies to make 6 cards. 99.9% of all the parts and pieces are cut to size so there is no measuring, just add ink or glitter as indicated or desired etc. Envelopes are also included. How is this Kit different than others? Some kits are a selection of papers and supplies and its up to you to create something from the contents. With my card kits the ideas are already created for you, but you are welcome to add or change anything. All you have to do is assemble them and enjoy. What do I have to supply? Pretty much just the basics. Scissors, adhesive, paper trimmer and maybe some glitter or ink. Are there directions? Generally there are no written instructions, unless I feel something warrants it. I will send a clear color copy of each card so that you can visually find where everything goes. 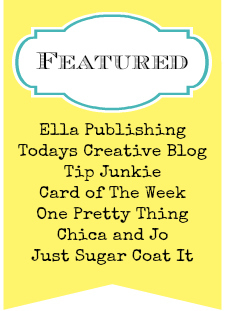 I also post each card on a dedicated blog page with tips and tricks. 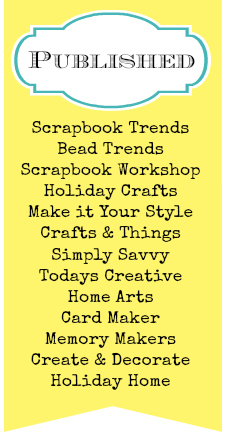 Do I have to be an "advanced" scrapper/crafter? In my opinion "No". These would be well suited for a beginner, but creative enough for a veteran crafter. My kits are a nice treat for yourself but also think about giving it to someone on bed rest or a senior that doesn't get out much. They'll love it! What kind of cards will I get? Each month I create a variety of cards. Almost always a birthday card, friendship, thinking of you, etc. If there is a specific holiday I usually will cover that the month prior, but I try to make it general so you can use it for something else if you don't celebrate that specific holiday. You can go to the sidebar of My blog homepage and click on "My Cards" o r Click here to go to gallery , that should give you an idea of my style. Also check out Click here past kits that are still available. What is the commitment? I would kindly ask that those interested commit for three months. I am always accepting new subscribers. Benefits? As a subscriber you will be placed on our "Favorite Shoppers" list this will give you a 10% discount on any other items on our site. 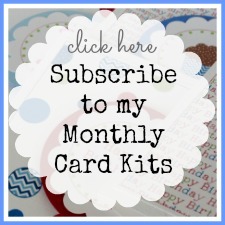 PLUS you'll receive free shipping on your monthly card kits! How will I be billed? For subscribers please check out using the Subscribe kit item. Doing so will purchase your first kit and we will send you directions on how to complete the subscription process. Each moth you will be billed automatically through paypal. When will the monthly card kits be ready? The monthly card kits will be ready to ship between the 10th-12th of each month.